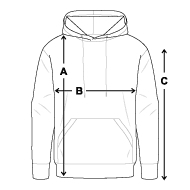 Cosy-warm hoodie for men, 80% cotton and 20% polyester. Logo is on the back. Choice of colours Check size the chart for the product before ordering - a garment that is too tight is uncomfortable but one a little on the large side will look better as well as being more comfortable.